Our range of products include digital therapy machine stroke acupuncture massage muscle s, e digital therapy slimming body massager, digital therapy machine with 4 pads, health herald digital therapy machine and digital therapy massager. A new generation of health product made in accordance with the principles of physics, bionics, electro-biology and the theories of traditional Chinese medicine Applied with digital technology, this unit transfers the physical factors necessary to the human body into precise digital signals and conducts comprehensive therapy through computer based on the requirements of the body Alleviates back pains, shoulder pains, muscle pains etc. 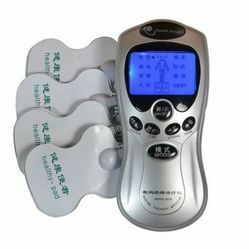 Efficiently relax you from stress and tiredness, full-body massager!! Lightweight, small and easy to keep in bag and carry around Suitable for daily use, traveling or business trip. 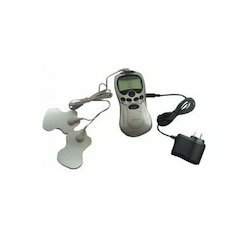 Great gift for yourself, family members and friends Digital Therapy Machine Electronic Pulse Massage Equipped with large size LCD, on which the intensity, functions, therapeutic time can be clearly displayed. The highest application rate and the best effect on body reaction by combining seven therapeutic methods, including slow stroke, united stroke, united stroke massage, acupuncture, scrapping, cupping, lowering blood pressure. Improves your body circulation, relieves your pain and promotes your metabolism. It is an ideal product suitable for who have stiff shoulder, end neural paralysis, neuralgia, shank ache, whole body fatigue, stomachache, bad cold, cervical vertebra neck ache, per arthritis, toothache, high blood pressure, low blood pressure, energy failure, week ability, irregular menstruation, various acute chronic diseases. 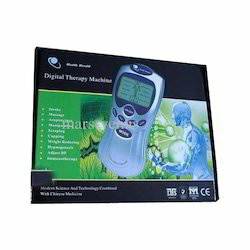 Looking for Digital Therapy Machine Importer in India ?